The greenback is stronger against all of its G10 peers before the US jobs data. The optimistic expectations (NFPs expected at 230K vs. 217K last) keep traders positioned long in US dollars. The US 10-year yields are however softer today (2.2411-2.2517%). USD/JPY finally broke 120-resistance, rallied to 120.25 on stops. Tokyo closes the week on green note (Nikkei +0.19%), the profit takings and corrective shorts will likely be the challenging on the upside before December 14th snap elections. Once the volatilities around 120 ease, we expect sustainable advance, traders already shift targets to 130s. Option bids are placed at 119.00/119.75/120.00/120.50/121.00 for today expiry. US nonfarm release will define the tone toward the closing bell: correction or extension? Yesterday’s major highlight has been the ECB meeting and the President Draghi’s press conference. As expected the ECB maintained status quo and Mario Draghi gave a dovish speech. Yet not sufficient for the EUR-bear appetite. EUR/USD spiked down to 1.2280, then rebounded to 1.2456. Unable to close above 1.2435/50 (yesterday MACD pivot / 21-dma), we keep our bearish bias and remain seller on rallies. Option positions are mixed at 1.2400/50 area, we see better appetite above 1.2470 today. The US NFPs should determine whether EUR/USD will make a second day of bull attempt or not. A week close below 1.2420 (MACD pivot) will keep the bias on the downside. EUR/GBP partially pared weekly losses on EUR gains, as no surprise came out of the BoE meeting. The bearish momentum weakened however the short term technicals have not reversed yet. Option related offers trail below 0.7955/0.7900 before the week’s closing bell. USD/CAD resistance is building at 1.14+. Canada also releases jobs and trade data today, the expectations are less optimistic then in the US. Trend and momentum indicators are marginally positive. We target a break above 1.1467 (year high) as long as 21-dma (currently at 1.1329) support holds. EUR/CAD seeks fresh direction. A breakout of 1.4065/1.4176 range (MACD pivot / 50-dma) is needed for fresh positions. The key highlight of the day is the US labor data: the change in November manufacturing, private and nonfarm payrolls, unemployment and participation rate and wages. Traders also watch German October Factory Orders m/m & y/y, Swiss November Foreign Currency Reserves, Spanish October Industrial Output m/m & y/y, Swedish November Budget balance, October Service and Industrial Production m/m & y/y, Norwegian October Industrial Production and Manufacturing m/m & y/y, Euro-zone 3Q (Prelim) GDP q/q & y/y, Euro-zone 3Q Gross Fix Capital, Government Expenditures and Household Consumption q/q, Canadian October International Merchandise Trade, Canadian November Unemployment and Participation Rate, US October Trade Balance, Factory Orders and Consumer Credit. The Japan GDP contracted 0.5% on third quarter (vs. -0.1% q/q exp. & -0.4% last), the annualized tightening has been -1.9%. The private consumption stabilized at 0.4% q/q, yet the business spending unexpectedly contracted by 0.9% q/q. Combined to Friday’s surprisingly high NFPs, USD/JPY advanced to the fresh high of 121.85 in Tokyo. EUR/JPY tests 150 offers. The deeply overbought conditions (RSI 83%) suggest choppy upside, while the high volatilities widen the Bollinger bands with upper end holding at 122.80 on USD/JPY chart. The snap elections are due on December 14th, we remain long gamma on JPY-crosses this week. The worst performers of this Monday verse USD have been AUD and NZD. The unexpected contraction in Chinese imports (-6.7% on year to November) pushed AUD/USD to 0.8266. Given the macro fundamentals and the moderate global recovery, AUD/USD is expected to continue its steady slide toward 80 cents, levels thought to do some good to Australian economy. The iron ore delivered to China remain below $72, five year lows. 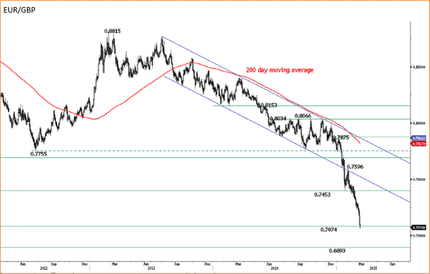 NZD/USD slipped below the former low of 0.7661.With stronger downside momentum, the focus shifts to 0.75s, 2012 lows. Chinese equities saw good demand (with Shanghai’s composite adding 3% before slightly easing) as traders bet for further PBoC intervention to make sure to fight the slowdown in Chinese economy. China releases November inflation figures on Wednesday. The consumer prices are expected stable at 1.6%, while producer prices are seen 2.4% down (vs. -2.2% prior). Soft inflation figures will give room to PBoC for more easing and trigger another wave of sell-off in Yuan. USD/CNY advanced to 6.1624. Next target zone stands at 6.1790/6.1803 (200-dma / Fib 61.8% on January-April rally). Released on Friday, the US nonfarm payrolls greatly surprised on the upside. The US economy added 321’000 nonfarm jobs in November versus 230K expected & 214K last. The average earnings accelerated by 0.4% on month, beating expectations of 0.2%. The unemployment and participation remained unchanged. Very positive data triggered an aggressive USD rally in New York session. EUR/USD hit a fresh 2-year low at 1.2271 yet corrected in Asia, instead of the continuation of the sell-off. A possible formation of inverted hammer in today’s session will confirm that market is trying to define a bottom at Friday lows. Option related offers trail below 1.2270 for today’s expiry. GBP/USD legged down to 1.5542 at the time of writing. Trend and momentum indicators deteriorate. A daily close below 1.5530 (MACD pivot) should signal the end of stagnation of the past month and push the Cable toward fresh bear market. EUR/GBP trades steady with option barriers at 0.7900/0.7915/0.7940 for today. In Canada, the jobs data has disappointed with 16’300 jobs lost during November. USD/CAD spiked to 1.1476, hitting fresh high as suspected. We expect further upside as long as the 21-dma (1.337) support holds. Today’s economic calendar: German October Industrial Production m/m & y/y, Swiss November CPI m/m & y/y, Swiss October Retail Sales, Swedish October Household Consumption m/m & y/y, Canadian November Housing Starts & October Building Permits m/m. The Japanese PM Abe’s LDP wins Sunday polls, yet with record low support to Abenomics. The Tankan index came in softer for large manufacturing composite, slightly better for non-manufacturing activity and sufficiently discouraging for all small caps. JPY-crosses traded mixed, Nikkei stocks opened the week 1.57% lower. USD/JPY saw support at Ichimoku base line 117.85. Trend and momentum indicators remain negative, and we see consolidation before renewed attempt above 120.00. EUR/JPY retreated to 146.84, deeper sell-off is expected toward Ichimoku baseline, 145.93. AUD/USD extended weakness to 0.8204 as government revised its year-end forecast for a wider cash deficit of AUD 40.4 billion from an early 29.8 billion due to weaker iron ore prices. “Primarily as a result of collapse in iron ore prices by over 30% and weaker than expected wage growth, tax receipts have been revised down” said Treasurer Joe Hockey. Spot iron ore delivered to China remains below $70. We expect AUD/USD to continue its steady slide toward 80 cents. In China, the USD/CNY is still subject to offers above 6.20+. Support is building above the 200-dma, currently at 6.1804. Chinese bureau of statistics is expected to announce improved GDP results this month. The key question is whether China achieved its 7.5% growth target in 2014 or not. EUR/USD opened the week above its 21-dma (1.2434), with short-term technicals still pointing on more correction. The pair is expected to make higher attempts before Wednesday’s FOMC meeting. Resistance is seen at 1.2540 (50-dma), then 1.2600 (Nov 19th high). We remain seller on rallies given that Fed/ECB divergence to inevitably continue weighing on the pair walking into 2015. EUR/GBP upside correction strengthens. A daily close above 0.7935 (MACD pivot) should push the cross higher. Decent option related offers trail below 0.7875 (Friday low) for today expiry. Better bid, GBP/USD tests Friday high of 1.5747 at the time of writing. The candle pattern analysis print a formation to bullish engulfing (conviction 5/9) signaling a short-term bullish reversal pattern. Option bids trail above 1.5700 and will likely give further support today. However, we are heading into an event-full week in GBP with CPI, jobs data and retail sales a due on Tuesday, Wednesday and Thursday respectively. Soft economic read is a risk for GBP-bulls; key support stands at 1.5542 (Dec 8th low). Today’s economic calendar: Swiss November Producer & Import Prices m/m & y/y, Norwegian November Trade Balance, Italian October General Government Debt, UK December CBI Trends Total Orders & Selling Prices, US December Empire Manufacturing, Canadian November Existing Home Sales m/m, US November Industrial Production & Capacity Utilization, US November Manufacturing (SIC) Production, US December NAHB Housing Market Index, US October Net Long-Term TIC Flows and Total Net TIC Flows. 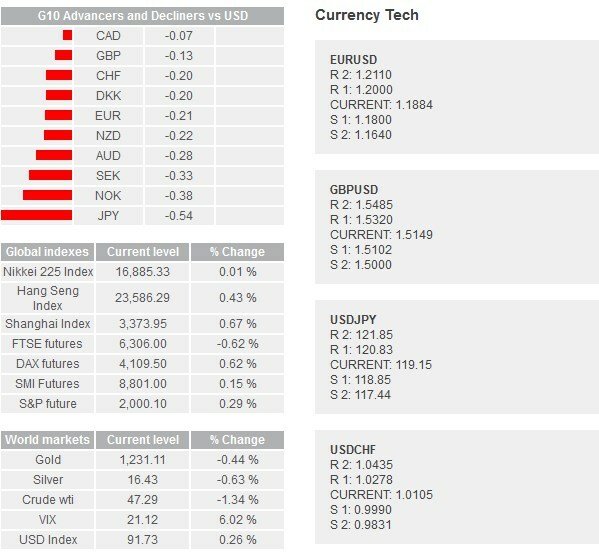 The FX markets adjust levels after highly volatile week on FOMC decision, oil drop and surprise rate actions from Russia and Switzerland. The Asian equity markets traded in green this Friday: Nikkei gained 2.39%, Hang Seng and Shanghai’s Composite recovered 1.33% and 1.67%, ASX rallied 2.45%. EUR/USD consolidated weakness at the tight range of 1.2274/98 in Asia. A week close below 1.2325 will send the MACD in the red zone. The EUR sentiment remains negative on ECB QE expectations as soon as the first quarter of 2015 and hawkish sentiment vis-à-vis the Fed policy outlook. Large option barriers trail below 1.2300 for the New York cut. GBP/USD will likely finish within its September – December downtrend channel. The surprise retail sales 6.9% y/y (ex-autos) failed to push GBP/USD into bullish consolidation zone amid the CPI fell to 1% y/y and the unemployment deteriorated to 6%. Option barriers trail below 1.5650 /1.5700 for today expiry. EUR/GBP took a dive to October-December ascending base (0.78325). The bias is negative, option barriers are solid at 0.7850/0.7900 for today expiry. Break below the base should signal deeper sell-off. The BoJ maintained status quo 8-1, leaving the annual monetary increase target unchanged at 80 trillion yen. The EconMin Amari said weak JPY benefits to exporters yet hurts households via high import costs. He added that the slide in oil is positive for recovery, but deflation should be avoided. At this point, we believe that markets question whether there is need for further JPY weakness. More importantly, is there any more benefit in further JPY slide? USD/JPY and JPY crosses were better bid in Tokyo. USD/JPY remained above the Ichimoku baseline (118.65) and advanced to 119.47. The bearish momentum slowed, decent option bids at 119.00 should give support before the weekend. EUR/JPY remains capped below its descending Ichi conversion line (146.92). USD/CAD topped at the Fibonacci 123.6% projection on July-November lift (1.1670s) through this week. The cooler sell-off in oil slowed down the loonie debasing post-FOMC, however the trend and momentum indicators remain comfortably bullish on USD/CAD. Canada releases the November inflation figures today. The headline CPI is expected to ease from last month’s surprise 2.4% to 2.2% y/y, yet the core index, excluding the most volatile food and energy prices, is seen faster at 2.5% y/y (vs. 2.3% a month ago). The macro situation is very challenging for Mr. Poloz. In one hand, the smash in oil markets should harm the already fragile Canadian recovery and require a flexible BoC policy. On the other hand, a strong CPI read should push the BoC toward a less dovish tone, given that the 2% inflation target is being desecrated seriously. USD/CAD option bids trail above 1.1475 before the week’s closing bell. The sentiment remains CAD-negative. Today’s economic calendar consists of German November PPI m/m & y/y, German January GfK Consumer Confidence Index, French December Production Outlook and Manufacturing and Business Confidence, Norway December Unemployment Rate, Italian October Industrial Sales and Orders m/m & y/y, Euro-zone October Current Account, UK November Public Finances, Italian November Wages m/m & y/y, Kansas Fed December Manufacturing Activity, Canadian November CPI m/m & y/y and October Retail Sales m/m. The New Zealand’s trade deficit narrowed faster than expected in November from NZD -908 million to -213 million (vs. -575mn exp. ), exports remained mostly stable (4.02billion), as imports decreased from 4.94 billion to 4.24 billion. NZD/USD remains offered below its 21-dma & Ichimoku conversion line (0.7775/76). The bias remains slightly negative. AUD/USD extends weakness to 0.8088 in the continuation of its steady slide toward 80 cents. The sentiment remains AUD-bearish with traders now betting on higher probability RBA rate cuts in 2015 on commodity sell-off and ECB QE. Bids are presumed pre-0.80, light option offers trail below. AUD/NZD consolidates at fresh year lows (1.0477) with further slide presumed. JPY crosses traded quiet due to Tokyo holidays. USD/JPY stepped gently above 120.00. With Abenomics still in charge post December 14th, the USD/JPY is ready to advance steadily higher. The first target sits at 121.85 (Dec 8th high). EUR/JPY remains well offered below the Ichi base line (147.37) on broad EUR-negative sentiment. Moody’s lowered Russia’s FX deposit ceiling to Ba1 from Baa2, foreign currency bond ceiling to Baa2 from A3, warned the Russian FX reserves will continue falling in 2015. The ruble unwind cools-off for the moment, there is talk of government forcing the main exporters to sell their excessive USD from business proceeds. In term, the broad direction remains RUB-negative. The support zone is seen at 48.70/50.00 (50-dma / psychological level). EUR/USD consolidates weakness a stone’s throw above the October-December descending base (1.2184). With expectations of the ECB announcing a full blown QE in January 22nd meeting should keep the EUR-complex under selling pressures. Decent option barriers trail below 1.23 for today expiry. EUR/GBP broke the October-December ascending base, consolidates pre-0.78. Trend and momentum indicators point for deeper downside. Decent option barriers keep the pressure tight at 0.7840/50 zone. The Cable trades ranged, the MACD will step in the red zone for day close below 1.5557. If GBP/USD holds ground above 1.5573 through the day, the formation of a tweezer top will be confirmed and announce minor bullish reversal before stepping toward fresh lows. Large put expiry waits for activation at 1.56 at today expiry. The US has a heavy economic calendar today before the year-end holidays. We will be closely monitoring the 3Q GDP third reading and the PCE (inflation index watched by the Fed). Today’s full economic calendar : French November Consumer Spending m/m & y/y, French, Spanish and Swedish November PPI m/m & y/y, Spanish October House Mortgage Approvals and Total Mortgage Lending y/y, Norway October Unemployment Rate, Italian October Retail Sales m/m & y/y, UK November BBA Loans for House Purchases, UK 3Q (Final) GDP and Total Business Investment q/q & y/y, UK 3Q Current Account Balance, UK October Index of Services, Canadian October GDP m/m & y/y, US November Durable Goods Orders, US 3Q (Third) GDP Annualized q/q, Personal Consumption, GDP Price Index, Core PCE q/q, University of Michigan’s December Final Consumer Confidence, Richmond Fed’s Manufacturing Index,, US November New Home Sales, Personal Income and Spending, PCE Deflator and PCE Core m/m & y/y. The USD is broadly in demand as the Fed releases December 16-17th meeting minutes later today. The Fed had dropped the “considerable time” rhetoric on December meeting, yet both the timing and the pace of the normalization remain a mystery. The US 10-year yields plunged shortly below 1.90% in New York yesterday as traders are concerned that the Fed may delay the first FF hike, or the normalization may occur slower than broad expectations. Traders will look for more clarity into Fed dots. We are however not sure to get any more precision in minutes. Overseas, the Japanese 10-year yields have also dropped to record lows (0.265%) while the JPY crosses were better bid. USD/JPY advanced to 119.17 (slightly below the 21-dma 119.30 and Ichimoku conversion line 119.40). Trend and momentum indicators remain marginally negative, with option bets skewed downwards at 120.00. EUR/JPY legs down to 140.57. The break below Fibonacci 50% on Oct-Dec retracement places the next support target at 200-dma (140.32). EUR/USD continues its slide before the Euro-zone’s preliminary December CPI read. The EZ has probably stepped in deflation (exp. -0.1% y/y), again due to significant fall in oil prices. If this is the case, the speculations for the ECB announcing a full blown QE as soon as January 22nd meeting should continue weighing on EUR/USD. However the high probability of QE already broadly priced in, the shock on the FX should be manageable. The statistical rational behind this expectation is the softening of 40-day correlation between EUR/USD and core/periphery yield spread (Spanish/German 10-year) to 38%, from above 50% from October to December 2014. Released yesterday, the Canadian raw materials price index decelerated by 5.8% on month to November, faster than 4.7% expected (and -4.3% m/m last); the crude energy being the major component responsible for the drop. The WTI extends weakness to $47. Canada’s November trade balance is due today, and will likely print a deficit due to loss on energy exports. USD/CAD advances to 1.1847 as BoC doves dominate at the current macro setting. Else, AUD/USD bounced lower after hitting Nov’14-Jan’15 downtrend top & 21-dma (0.8158). Depending on market reaction to Fed minutes, AUD/USD is capable of stepping into a short-term bullish consolidation zone (above 0.8158). Given our AUD-bearish view, we remain seller on upside attempts. In New Zealand, the ANZ commodity price index dropped another 4.4% on month to December, a 10th consecutive fall for total slide of 17.2% on year. Fonterra GDT price recovered 3.6%, with volumes off however. NZD/USD trades ranged within the slight descending channel building since October. The economic calendar of the day: German November Retail Sales m/m & y/y, Swiss December Foreign Currency Reserves, German December Construction PMI, German, French and Euro-zone December Retail PMI, German December Unemployment Rate, Italian December (Prelim) CPI m/m & y/y, Euro-Zone December Unemployment Rate, Euro-zone December CPI Estimate y/y and (Prelim) Core CPI, US January 2nd MBA Mortgage Applications, US December ADP Employment change, Canadian November International Merchandise Trade, US November Trade Balance, Canadian December PMI. 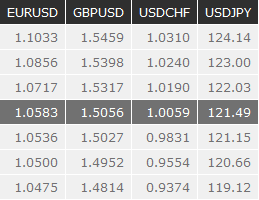 The FX markets are heading into another important week, after sizeable squeezes triggered by the SNB’s stepping out of the EUR/CHF currency peg on January 15th. The fact that the policy decision has been taken so abruptly hints that the SNB should have been heavily skeptical on the upcoming ECB meeting. The ECB will meet on Thursday, January 22nd and is expected to announce the so-expected full-blown QE (sovereign debt purchases). However we believe that the ECB may refrain from taking a concrete step in this month meeting as there are important pending questions around this subject, the leading ones being the size of the operation but also whether the ECB should buy Greek debt (while we are talking about a potential Grexit as Syriza may win general election due on January 25th). This being said, the actual size of the ECB balance sheet (2.1 trillion euros) is still significantly lower than Draghi’s 3 trillion target. This clearly leaves room for massive QE operation. Moreover there are talks that the national central banks may be charged to buy sovereign debt instead of the ECB. In this scenario, the size of the operation may turn out to be more than the 500 billion euros. The markets will be looking at 750bn - 1 trln operation. All in all, the selling pressures on the EUR-complex will likely remain until more clarity on the ECB. EUR/USD sold-off to 1.1460 on Friday and gap-opened at 1.1530 in Asia (after closing at 1.1569 in NY) recovered slightly1.1575. EUR/GBP traded below 0.76. We remain seller on EUR rallies. Released on Friday, the US consumer prices retracted 0.4% on month to December, pulling the year-on-year CPI down to 0% (from 0.1% y/y exp. & last). The industrial production contracted 0.1% over the same month as expected (vs. +1.3% a month ago). Despite gloomy US data, the USD ended last week well bid across the board, extending its gains above 1% against JPY and EUR in New York. The USD long future positions expanded to 7 week high according to latest CFTC release. In China, the Shanghai's Composite plunged more than 6% as the regulatory commission suspended margin trading of major brokerages on malpractices. AUD/USD rebounded down from 0.8244. With marginally positive technicals, the pair should continue challenging the topside, while 0.8250-0.8300 offers should counterweigh the bulls given the weak commodities and the USD appetite. USD/JPY and JPY crosses traded mixed today. USD/JPY remained offered pre-118.00 in Tokyo, as Nikkei failed to hold ground above 17'000. Trend and momentum indicators remain in the bear zone, with solid resistance seen at the daily Ichimoku cloud top (118.75). EUR/JPY consolidates weakness before ECB-BoJ policy verdicts (Wed - Thu respectively). We expect the BoJ to maintain status quo and possibly revise the short-term inflation expectations lower while keeping the target unchanged. The loan support program may be announced this week helping USD/JPY to hold ground above our 115.50/57 (Fibonacci 50% on Oct-Dec rally / December low). USD/CAD advanced to fresh high 1.2047 on Friday. Trend and momentum indicators are comfortably bullish before the BoC decision (Wed). Given the weakness in oil markets, the BoC is expected to sound dovish on the policy to sustain the fragile Canadian recovery. The USD/CAD will likely clear resistance at 1.20 through the week. Option related bids trail above 1.1950/1.2000 on dovish BoC expectations. Today’s economic calendar: Swiss December Producer & Import Prices m/m & y/y, Norwegian 4Q Existing Home Sales q/q, ECB November Current Account Balance, Euro-zone November Construction Output m/m & y/y and Canadian November International Securities Transactions. As expected, the BoJ kept its policy unchanged, cut its core inflation forecast down from 1.7% to 1.0% for fiscal year 2015 and expanded its loan programs. While the BoJ’s inflation target is at risk, a vast majority understands that lower oil prices are positive for the economic recovery, despite deviation from the inflation target. JPY crosses traded sluggish in Tokyo alongside with Nikkei stocks (-0.49%). USD/JPY legged down to 117.30. Offers remain solid above the daily Ichimoku cloud top (118.54) and 50/21 dma (118.68/94 respectively). Key support stands at 115.50/57 (Fibonacci 50% on Oct-Dec rally / December low). EUR/JPY consolidates between Fibonacci base and 23.6% on December - January sell-off (134.71/138.27). The broad EUR-negative sentiment is still favorable for top selling strategies. Resistance is seen at descending conversion line (138.04). In New Zealand, the CPI decelerated 0.2% in the 4Q, pulling the CPI y/y down to 0.8% from 1.0% previously. NZD/USD trades ranged in slight negative trending 0.76/0.80 range for the past four months. The short-term technicals turn negative suggesting a move toward 0.7548 (Oct-Jan downtrend base). esistance presumed at 21/50-dma (0.7760/76). Option barriers trail below 0.7685 for today expiry. EUR/USD traded in the tight range of 1.1542/1.1588 in Asia. Trend and momentum indicators are comfortably negative before the ECB verdict due tomorrow. We remain seller on rallies. Decent option barriers trail below 1.1700/25 for today expiry, light vanilla calls are seen at 1.1600/40. EUR/GBP holds ground above 0.76 with negative bias before the UK jobs and BoE minutes. A break below 0.76 should fast track a move toward 0.75 and below (beginning of 2008 levels). Option barriers are solid at 0.76/0.75 through the week. The Cable remains supported at September-January downtrend base 1.5031. The MACD is at the zeroline as the event/data risk remains high in the UK today. Market expects good labor data in November/December print with improvement in unemployment rate but more importantly a significant progress in weekly earnings from 1.6% to 1.9% on 3-months to November. In addition, the BoE releases meeting minutes and is expected to have kept its balanced tone given the persisting risks in the Euro-area and gloomy global growth outlook. The disinflationary pressures mostly due to lower oil prices certainly gives room to the BoE before rushing toward the policy normalization. GBP/USD should gain fresh direction today. Technically, a daily close above 1.5096 suggests short-term bullish attempt, while failure to break above 1.5269/67 (Jan 14/15th highs respectively) should suggest renewed pressures toward 1.50 support. Decent vanilla puts trail below 1.5055 and should weigh on the Cable if trapped below this level. USD/CAD rallied yesterday through European and Canadian sessions. The renewed selling pressures on oil (WTI lost above 5% on session) pushed the pair to 1.2115. The BoC meets today and is expected to maintain the status quo. The accompanying statement however is expected to remain dovish given the ongoing squeeze in oil markets. Trend and momentum indicators are comfortably bullish, suggesting further advance toward Fibonacci 76.4% level of 1.2205. Option related bids trail above 1.1975 for today expiry and should help reinforcing ground above 1.20. The key mid-run technical resistance stands at 1.2734 (2005 high), then 1.3065 (2009 high). Today, the BoE releases minutes and the BoC gives verdict. The economic calendar: Swiss December M3 Money Supply y/y, UK December Claimant Count Rate and Jobless Claims Change, UK November Unemployment Rate & Weekly Earnings 3m/y/y, Credit Suisse’s ZEW Expectations in Switzerland for January, Canadian November Wholesale Trade Sales m/m, US December housing Starts and Building Permits m/m. Today’s key event is the much expected ECB meeting. The ECB is expected to announce a full blown QE and the expectations are running quite high. The consensus is the announcement of a package worth 500 billion euros, while with a risk-sharing framework, markets will be looking for a 750 billion to 1 trillion euro operation. Details on the operation, including distribution of purchases, duration, conditions etc. will determine the EUR direction today, decent price action is on the wire. EUR/USD advanced to 1.1641 in New York yesterday until Dow Jones reported the ECB could propose 50 billion euro QE per month. Not only that the news had no official confirmation/background what-so-ever, but in addition, the number is roughly in line with official expectations. This proves how tense the EUR market is before the ECB meeting. We remain vigilant as high, two-sided volatilities should dominate the EUR-complex today. Option offers on EUR/USD trail below 1.1500, light bids are seen above1.1700/50. The BoC unexpectedly cut the bank rate from 1.0% to 0.75% as oil shock is expected to further boost the inflation downwards while increasing risks on financial stability. USD/CAD rallied aggressively to 1.2394 and stabilized at 1.2326/73 area in Asia. Despite the deeply oversold conditions (RSI at 85%, 30-day upper Bollinger band at 1.2220), the unexpected dovish shift from the BoC is expected to keep the selling pressures tight on the Loonie. We see support forming at 1.2205 (Fibonacci 76.4% level on 2009-2011 sell-off). The key mid-run technical resistance stands at 1.2734 (2005 high), then 1.3065 (2009 high). EUR/CAD pulled out 21, 50 and 100-dma yesterday. Strong resistance stands at the 200-dma (1.44431) as EUR negative pressures persist pre-ECB. JPY crosses traded mixed in Tokyo, Nikkei stocks gained 0.28%. Foreign investors stepped away from Japanese stocks and bonds on week to January 16th, Japanese investor bought 657.4 billion yen worth foreign stocks while unwinding 397.2 billion worth foreign bonds. The net interest in Japan assets was negative. USD/JPY advanced to the Ichimoku base line (118.35). Offers are still aligned above the daily cloud top (118.65), with conversion line trending negative. As the negative momentum loses pace, option bids at 118.00+ will soon call for a trend reversal. However the pressures on the EUR/JPY will be important from today. Should the EUR sales accelerate, the impact on JPY crosses will be somewhat negative. In China, the PBoC injected 50 billion yuan via 7-day reverse repo to meet seasonal demand before the Lunar New Year. USD/CNY rebounded from the 21-dma (6.2088), key support stands at 200-dma (6.1818) given expectations of additional monetary stimulus to further boost the economic activity. NZD/USD sales accelerated yesterday, the pair drilled below our 0.7548 target (Oct-Jan downtrend base) and traded to 0.7514 for the first time since June 2012. We see deeper downside potential as the bearish momentum strengthens. The next support stands at 0.7457 (2012 double bottom), then 0.7343 (Fibonacci 61.8% on 2009-2011 uplift). The negative rates in Swiss franc are effective starting today. USD/CHF holds ground above 0.8500, while EUR/CHF stabilizes around 1.00. The ECB decision should give fresh direction to EUR/CHF amid last week’s historical drop. Besides the ECB decision and Mario Draghi’s speech, traders will keep an eye on Spanish 4Q Unemployment Rate, Swedish December Unemployment Rate, Italian November Industrial Orders and Sales m/m & y/y, UK December Public Finances and Public Sector Borrowing, Euro area 3Q Government Debt, Italian November Retail Sales, UK January CI Trends Total Orders and Selling Prices, US January 17th Initial Jobless and January 10th Continuing Claims, Euro-Zone January (Prelim) Consumer Confidence and Kansas City Fed Manufacturing Activity in January. The ECB unveiled the much expected QE program yesterday. In addition to its private bond purchases introduced in the last quarter of 2014, the ECB will start buying 60 billion euros government debt and European institutional debt starting from March 2015 to September 2016. The total amount of the program sums up to 1.1 trillion euros, which exceeds the already aggressive market expectations (750 billion to 1 trillion euros anticipated with NCBs being part of the program). The NCBs will hold 80% of domestic bonds, while the 20% of risk will be shared. “I am surprised the risk sharing issue has become the most important aspect of the effectiveness of our monetary policy. » said Draghi as such framework brought a level of fragmentation in the heart of the Euro-zone’s single monetary system. The euro sold aggressively after the announcement, taking out the 2005 low (1.1460). Asian traders pulled EUR/USD down to 1.1315 for the first time since September 2003. The heavy unwind deepened the oversold conditions (RSI at 19.5%).The sentiment is comfortably negative. We believe short-covering is underway yet decent option barriers should limit the upside attempts pre-weekend. Large put expiries are seen at 1.1450, 1.1400, 1.1350 and 1.1300. EUR/GBP extended losses to 0.75523 (beginning of 2008 levels). Large option barriers at 0.76 should keep the selling pressures tight on the cross before the week’s closing bell. EUR/JPY tumbled down to 133.95, therefore fully writing-off Oct-Dec gains. Decent JPY demand verse EUR limited gains on the entire JPY-complex. USD/JPY made a timid step above its daily Ichimoku cloud top (118.47). A week close above 118.58 (MACD pivot) should call for short-term bullish reversal. Option bets are positively skewed above 118.35/50 zone today. Danish National bank cut its deposit rate from -0.20% to -0.35% post ECB QE announcement, signaling further stress on the EUR/DKK peg. While DNB still has room to defend the peg, we believe that two interventions in a week has just attracted speculators’ attention, and might push the bank toward more aggressively defensive strategies in the coming weeks, months. AUD/USD stepped below 80 cent as the cheap liquidity environment and persistent weakness in commodity prices increase speculations for an RBA cut on February 3rd meeting. Failure to close above 0.8050/54 (MACD pivot & intraday high) should signal the end of the bullish correction era. From next week, the option barriers are solid at 0.80+. The Cable clears support at 1.50. Next support stands at 1.4814 (2013 low). The GBP/USD 1-month risk reversal steadily slides lower confirming the broad negative bias following the dovish shift in the heart of the BoE. Today’s economic calendar: French January Manufacturing and Business Confidence, French, German and Euro-zone’s January (Prelim) Manufacturing, Services and Composite PMI, UK December Retail Sales, Chicago Fed’s National Activity Index in December, Canadian December CPI m/m & y/y and November Retail Sales m/m, US January (Prelim) Manufacturing PMI, US December Existing Home Sales m/m and US December Leading Index. 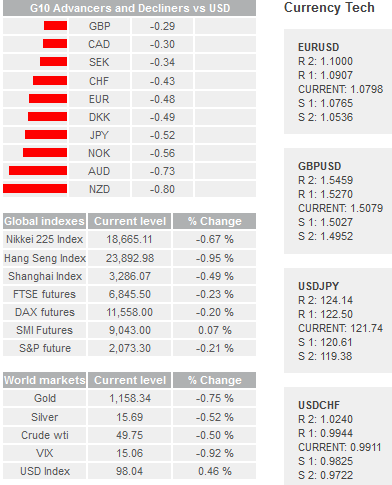 Financial markets are subdued, with slight USD buying, as event risk looms in the near term. The FOMC Chair Yellens congressional testimony, Greece’s submission of final reform list to creditors today and China back from an extended Lunar New Year holiday tomorrow has FX traders in wait-and-see mode. However, equity markets remain bullish. Following the US strong close, the Nikkei rose 0.74%, ASX climbed 0.32% while the Hang Seng sell-off -0.42%. Supported by a solid Nikkei recovery and optimism of a EU/Greek bailout extension, USDJPY (JPY broadweakness) was a one directional bullish trade to 119.35 from 118.80. EUR/JPY rallied from 134.65 to 135.20 in consideration. EURUSD bounced around between 1.1330 and 1.1340 for most of the Asians session with most participants sidelined before Yellens testimony. AUDUSD was hit by light trading and tripped stops below 0.7780 sending the pair down to 0.7765. AUDUSD is focused on key support at 0.7740 which break could trigger an extension of bearish momentum to 0.7630. US rates were slightly softer falling to 2.0714%. German Q4 GDP growth to be unchanged from the flash estimates at 0.7% q/q. Euro area final HICP inflation is also unchanged at -0.6% y/y in January, after falling from -0.2% y/y in December. Greece missed Mondays deadline for the reform proposal list which is a condition for extending the country's bailout program but government officials indicate the economic reforms plan will be delivered today. Productive developments between the Greek government and the Eurogroup will likely generate bullish relief rally, yet structurally we remain negative on the pair. Any recovery towards 1.1450 potentially due to Eurozone peripheral bonds to reacting positively to an agreement would be seen as an opportunity to reload shorts. BoE Governor Carney will testify on the central bank’s February 2015 Inflation Report. GBPUSD focus stays on 1.5492, break above which would see bullishness extend to 1.5620. EURGBP’s bearish extension below channel support at .7365 indicates a broader move to .7255. Markets await Fed Chair Yellen’s semi-annual testimony to Congress today and Wednesday. Trader will be hoping for some clarity around inflation and labor markets to derives a view on timing. We could also get some comment regarding the recent USD strength, that would easily generate market volatility. Despite Fed Chair Yellens slightly dovish testimony FX markets were broadly unchanged. EURUSD gained slightly to 1.1350 while GBPUSD rose to 1.5475. AUDUSD climbed to 0.7877 on the back of stronger China PMI manufacturing. NZDUSD firmed around 0.7530. Asia equity markets were broadly higher. The Nikkei rose 0.10%, Kospi up 0.8% while Shanghai was flat on return for the long holiday. US treasury yields were stable as the 10 yr lingered around 1.988%. Fed Chair Yellens highly anticipated testimony indicated that policy decision would be data dependent and considered on a meeting by meeting basis. She did make is clear that no rate hike would be imminent, but the ground work was ready for tightening later this year. She told the Senate banking committee that the economic recovery was solid being led by the labor markets. In addition she hinted that wages should start to increase. In regards to inflation Yellen stressed it was too low for the feds liking however, weakness was due to softer oil prices and medium term inflation should rise to 2%. USD was only slightly weaker on the comments since there was really no new information above the recent FOMC meeting minutes. The new Greek government submitted its proposal for economic reforms to extended it 172bn bailout for up to four month which was quickly approved by the Eurozone finance ministers. According to news reports two of the three member of the Trioka are already expressing doubt over the New Greek plan. A clear signal to Greek that its position in the EU is far from secure. In the statement by the Eurozone announcing the acceptance of the plan ministers suggested that it was a “valid starting point” for negotiations on the bailouts new terms. In addition they expected Athens to provide more details to the current plan in the weeks to come. EUR bas only slightly stronger on the news as the optimism around the extension has run out. The market is now pricing in a high probability that “Grexit” will become a reality. This plan only halts the inevitable. 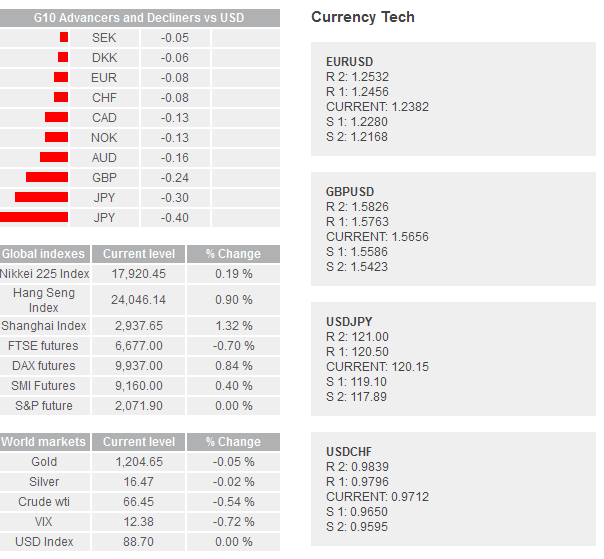 FX markets were basically unchanged with slight USD weakness after Fed Chair Yellen wrapped up her semi-annual testimony. Asia regional equity indices were mixed. The Nikkei rose 1.08%, the Hang Seng index was up 0.38% and the Shanghai composite index climbed 2.15%. ASX and Taiwan were both marginally lower. In the forex markets, the major were range bound, with broadbased liquidation of USD longs. EURUSD edge up on the dovish Yellen comments to 1.1375. However, demand was thin and focus will be on 1.1330 to 1.1390 range. With risk from Greek having subsided we anticipate EURUSD to weaken on divergent monetary policy paths. Australia’s private capital expenditure Q4 2014 collapsed -2.2% against expected -1.6%. The weak CAPEX pushed AUDUSD down to 0.7837 before bargain hunters pushed the pair marginal higher to 0.7855. Expectations for a RBA OCR rate cut at next week meeting spiked from 40% to 52%. AUDUSD focus will be on channel support at 0.7620 as a dovish Fed clear the way for the RBA to cut further. New Zealand’s trade surplus increased to NZ$56mn in January against a market expected deficit of NZ$158mn. New Zealand January’s imports fell to NZ$3.64bn while exports decreased to NZ$3.70bn. Solid trade data help NZDUSD recovery off the session lows at 0.7550 but unable to clear stop heavy 0.7577 barrier. In BoJ Governor Kurodas testimony to the Diet never shifted from his traditional line. He stated that prices will continued to rise and would adjust policy as necessary. Kuroda went on to say that QQE policy was not to target FX prices but focused on price stability. It seems to suggest that recent comments addressing potentially shifting the inflation target might lack critical board support. In addition, a report in the WSJ suggest that Japanese PM Abe would guide the balance of the BoJ board if necessary. This suggests that when dissenter Morimoto term expires in June another reflationist would be appointed to the BoJ’s Policy Board. For most of the Asian session, JPY was weaker across the board as the USDJPY rallied to 119.10 (aided by closed stressed shorts). We anticipated a sideways range 118.64 to 119.09 for now while markets absorb Yellens comments, the Greek bailout agreement and escalation in Ukraine – Russian tensions. 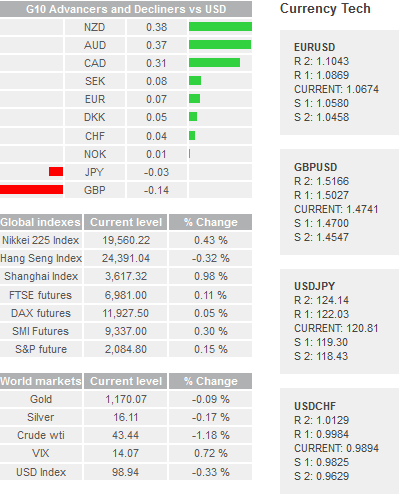 Today, traders will be watching Spanish Final GDP, EA M3 and Euro area confidence. In the UK, GDP growth is expected to come in at 0.5% q/q in Q4, falling from 0.7% q/q in Q3 and BoE Deputy Governor Shafik is also due to speak. In the US, CPI and Durable Good Order data are expected. Market anticapate CPI should see a monthly drop in headline inflation to -0.6%, while the focus will be on Core CPI (given Fed comments and last month drop) expected to easing to 0.1%, which would hold steady at yearly data at 1.6%. Fed Chair Yellen’s testimony should cap USD upside till next week’s US payroll report. Unexpectedly, the RBA kept its cash rate target unchanged at 2.25% citing that policy easing may still be appropriate in the future and further AUD depreciation should help balancing the growth (seen below trend). The Australian current account balance narrowed faster-than-expected to AUD -9.6bn from AUD -12.1bn (revised) in 4Q. The RBA is seemingly in effort to keep margin for future maneuver, closely monitoring the inflation, housing and commodity prices. The surprise inaction from the RBA is certainly a strategic “move”, aiming to inject the uncertainty needed in the Australian money markets so that business owners are not pushed to wait for lower rates to boost their activity. AUD/USD hiked to 0.7842 post-announcement (a stone’s throw below yesterday high 0.7845). While the short term trend indicators continue pointing for an upside bias, offers are presumed strong at 0.7955/0.8000 (50-dma / Oct’14 – Feb’15 downtrend channel top & optionality). We keep our mid-term target unchanged at 75 cents verse USD. Japan monetary base expanded to 278.9 trillion yen end of February. USD/JPY and JPY crosses were mixed. USD/JPY remained limited by offers at 120+ as PM advisor Honda said the BoJ should not overheat the economy. The rise in AUD/JPY post-RBA helped keeping the USD/JPY supported above 119.57. The key short-term resistance is seen solid at 120.47/48 (February 11/12 double top). In Switzerland, the GDP growth remained stable in 4Q at 0.6% q/q and 1.9% y/y despite expectations for an economic slowdown. The fourth quarter has certainly been the beginning of a challenging period for the Swiss economy, with the first negative rates introduced in December (effective in Jan 22nd). The most expected economic results are those of Q1, amid the SNB decided to remove the EUR/CHF floor. Therefore, the market reaction remains skeptical to 4Q figures given that the damages caused by the free-float EUR/CHF will be visible only from Q1 data. EUR/CHF sees choppy trading between 1.05/1.10 area on business owners and households’ cautious stance vis-à-vis the fragile appreciation in EUR, especially with the persisting uncertainties regarding the Greek situation. EUR/USD consolidates weakness before Thursday’s ECB meeting. The bias remains on the downside as traders look to sell the rebounds. The persistent risks on Greek solvability weighs on the EUR-complex while the Greek FinMin Varoufakis said to be confident that Greece will service its March obligations. EUR/USD offers remain thick at 1.1340/1.1445 (21-dma / Fibonacci 23.6% on Dec’14-Jan’15 sell-off). USD/CAD trades ranged before the GDP read due later today. The fourth quarter GDP is expected to have fallen from 2.8% to 2.0% annualized, while some improvement must have been occurred through December according to optimistic market expectations. USD/CAD hovers around the 21-dma (1.2504) mostly in short-term bearish consolidation zone amid the pair hit 1.2799 on Jan 30th. Key support to consolidation is placed at 1.2395 (ascending baseline building since Jan 22nd) as oil prices have hard time to pick up in the short-run. The WTI tests $50.20/50 (21 & 50 dma). Today’s economic calendar consists of Swiss 4Q GDP q/Q & y/y, German January Retail Sales m/m & y/y, Spanish February Unemployment, UK’s February Construction PMI, Euro-zone January PPI m/m & y/y, Canadian 4Q quarterly GDP Annualized and December GDP m/m & y/y, Canadian January Industrial and Raw Materials Price Index m/m and ISM New York in February. The Central Bank actions continue dominating the week’s economic headlines. Following the PBoC rate cut, the RBI lowered the benchmark repo rate by 25 basis points to 7.50% via surprise action in an effort to “compensate the delay in fiscal consolidation” and comply with PM Modi’s budget announcement (surprising: as higher budget deficit would be expected to trigger the opposite reaction). The decision should help USD/INR to strengthen ground at Fibonacci 61.8% retracement 61.7664 on May-Dec’14 rise) as speculations for additional rate cut should reverse the mid-term INR appetite. In Australia, the GDP growth accelerated to 0.5% q/q in Q4 (from 0.3% revised, vs. 0.6% exp. ), the annual growth remained stable at 2.5% end of Q4 (vs. 2.7% prev). AUD/USD slid shortly to 0.7796 (21-dma) in Sydney alongside with sell-off in the stock markets (ASX 200 -0.54%). Short term trend remains positive with slowing momentum however. Resistance is seen solid at 0.7950 / 0.8000 (50-dma / Oct’14 – Feb’15 downtrend top). The Canadian economy grew 0.3% m/m and 2.8% y/y in December, therefore curbing the annual GDP slowdown, 2.4% q/q annualized in Q4 (vs. 2.0% exp. & 2.8% last). The 3Q growth has been revised up to 3.2% from 2.8% y/y. Figures are perfectly in line with BoC’s 2.5% forecast. While the risk that the negative impact of sliding oil prices may have not been over yet, the expectations for a second consecutive rate action fade. The consensus is a status quo at 0.75% at today’s policy meeting. USD/BRL advanced to fresh 10-year high of 2.9342 amid rumors that an agreement on Rousseff’s fiscal proposal to roll back tax breaks (estimated at 60 billion BRL) may not be reached. Markets are craving for stronger fiscal conditions in Brazil and Rousseff’s team is given little error margin. Should the political uncertainties keep FX volatilities high, the BCB will have no choice but to continue intervening via its FX swap program to curb renewed political tensions in BRL markets. The BCB is expected to increase its Selic rate by 50 basis points to 12.75% at today’s meeting. The policy tightening will likely cool-off selling pressures on the BRL, while renewed upside pressures should continue pushing the pair toward 3-psychological level pre-US jobs data (ADP due today; NFPs, unemployment and earnings due Friday). 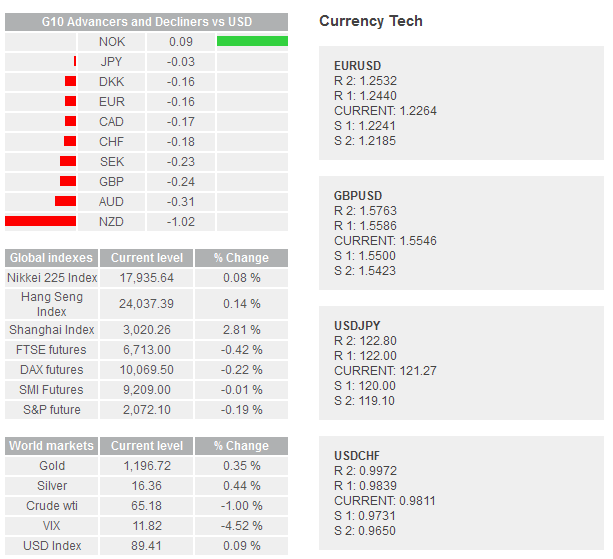 EUR/USD consolidates weakness in tight range of 1.1164/86 in Asia, while GBP/USD retreated to 1.5340/72 band. The ECB and BoE verdicts are due tomorrow. While the sterling pound pares gains on pre-election talks, the EUR-sentiment remains negative with Greek turmoil still in headlines. Else, the DNB Bank sold DKK 168.7 billion in February to defend EUR/DKK cap (beating 168.5 bn expected) after January’s 106.6 billion sales. The FX reserves rose to a record DKK 737.1 billion end of February (almost 40% of country’s GDP). The DNB’s struggle to weaken DKK is not over as speculator appetite to test the peg persist. For the time being, we do not see risk on the peg. 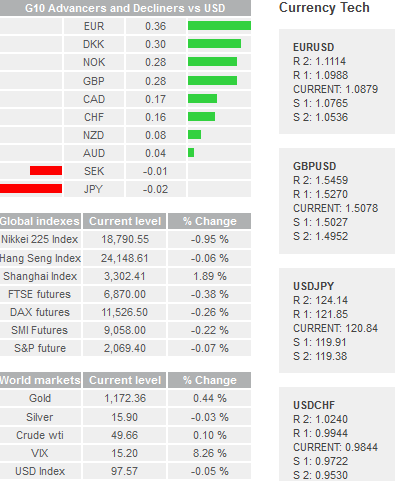 Traders also watch February Final services PMI across the Euro-zone and the UK and the US, UK February Official Changes, Euro-zone January Retail Sales m/m & y/y, US February 27th MBA Mortgage Applications, US February ADP employment Change and US Federal Beige Book. Today’s key events are the BoE, the ECB verdicts and ECB President Draghi’s press conference (at 12:00, 12:45 and 13:30 GMT respectively). The consensus is status quo on both meetings, while ECB President Draghi’s speech should trigger price action later in the day. The sell-off in the EUR-complex accelerated in New York yesterday, sending EUR/USD down to 1.1026 overnight, a fresh 11-year low. For some, the renewed EUR weakness is due to increased anxiety vis-à-vis the QE that will start by next week, for others the Greek turmoil is still an important weight on EUR’ shoulders. Improved economic outlook from the ECB is the risk for EUR-shorts today, yet the broad bias remains comfortably negative. Key support sits at 1.10 psychological level; stops and large option barriers trail below. In the US, the ADP data showed the economy added 212’000 new private jobs in February as last month reading has been significantly revised up to 250K (from 213K). The USD-bulls remain in charge, especially against the EM currencies. USD/TRY hit new all-time-high of 2.5773 as USD/ZAR rallied to 11.8578. USD/BRL tested 3.00 although Brazil Central Bank raised the Selic rate by 50 basis points to 12.75% as expected. Already priced in, the rate hike did little on FX prices. There is good chance that the USD appetite dominates until Friday’s nonfarm payrolls, unemployment and wages announcement. The 10-year US sovereign yields traded above the 100-dma (2.1163%) for the first time since Sep’14. USD/JPY and JPY crosses were sluggish in Tokyo. USD/JPY offers above 120 remain solid with good option barriers to be cleared. The key resistance remains at 120.47/48 (Feb 11/12th double top), bids should jump in at 118.77/119.17 area (50/21-dma). EUR/JPY eased to a-month low, the MACD (12, 26) stepped in the bearish zone suggesting high sensibility to EUR-negative sentiment vis-à-vis the ECB/Draghi today. Option barriers trail below 132.80 at today’s expiry. In Australia, the trade deficit widened above expected to AUD 890mn in January (vs -925mn exp. & -503mn revised in Feb). RBA’s Lowe said the policy changes across the globe put “upside pressures on the value of other currencies where the need for monetary stimulus has been less”. While the higher AUD leads to lower domestic demand, the signals for further stimulus weigh on the AUD-complex. AUD/USD remains offered at 0.7845/60 area. More resistance is eyed at 0.7943/0.8000 (50-dma / Oct’14 – Feb’15 downtrend top). The Bank of Canada kept the bank rate unchanged at 0.75% in line with consensus. USD/CAD sold-off to 1.2407 (Jan-Feb triangle base). Trend and momentum indicators are supportive of further recovery in loonie whereas the symmetric triangle base building since January 22nd should lend support before the US and Canada jobs data (due Fri). A break below the base should intensify short covering in CAD as long as the oil prices hold ground. Traders also watch French 4Q Unemployment Rate, German January Factory Orders m/m & y/y, Swedish January Industrial, Service Production and Industrial Orders m/m & y/y, UK February New Car Registrations, Italian 4Q Final GDP q/q & y/y, German, French, Italian and Euro-zone aggregate Retail PMI in February, US 4Q (Final) Nonfarm Productivity and Unit Labor Costs, US February 28th Initial Jobless & February 21st Continuing Claims, US January Factory Orders and Canadian February PMI index (Ivey). Today’s key event is the US jobs data. Amid good ADP read on Wednesday, the consensus for the NFP is a strong 235K (vs. 257K last month) with lower unemployment rate (5.6% vs. 5.7% last) and higher wages in February. The US 10-year bonds stabilize at about the 100-dma (2.1162%), sign of increased expectations for the Fed rate hike to happen sooner rather than later (June is the earliest we see). USD/JPY advanced to 120.40 in New York yesterday (a stone’s throw lower than Feb 11/12th double top (120.47/48). The bias remains positive with good USD appetite. US jobs data will determine whether it is time to pull out the resistance and challenge Dec’14 high (121.85). Large vanilla calls above 119.80/120.00 should limit the downside before the week’s closing bell. USD/CHF extended gains to 0.9750, EUR/CHF holds ground above the 21-dma (1.07445) still choppy on the upside with globally negative EUR sentiment. In line with the consensus, the BoE and the ECB maintained status quo in March. While the BoE decision gathered little attention, the ECB President Draghi’s speech triggered price action in the EUR-complex. EUR/USD first rallied to 1.1114 on favorable inflation expectations and economic outlook, then tumbled down to fresh 1-year low of 1.1006 as 1. ECB said the QE may extend beyond Sep’16 if needed, 2. ECB will buy negative yielding bonds up to deposit rate and 3. Greek banks are in good shape yet progress on bailout is needed to avoid a situation where the country would not fulfill the conditions to become eligible and therefore would be left out of the QE program. The sentiment in EUR remains negative while the failure to break below 1.10 psychological support will likely encourage corrective bids before the US NFP read in New York today. A strong read should trigger fresh sell-off in EUR/USD and challenge the 1.10 support for the second consecutive day. In Brazil, USD/BRL traded above 3.00 (hit 3.0216) for the first time since 2004 on broad USD appetite. February inflation is due today and is expected to accelerate to 7.56% from 7.14% last. Higher inflation keep the BCB-hawks alert, however the selling pressures in real should remain pre-NFPs. Moving forward, although the political tensions are long-term issue, temporary cool-off will create window for tactical long carry positions (with relatively interesting rate spread amid additional 50 bp hike on Wednesday meeting). Besides US jobs (February NFPs, unemployment & participation rate, earnings), traders watch the SNB’s FY earnings and February FX Reserves, German and Spanish January Industrial Production m/m & y/y, French January Budget and Trade Balance, Spanish January House Transactions y/y, Swiss February CPI m/m & y/y, Swedish February Budget Balance and Average House Prices, Norwegian January Industrial Production and Manufacturing m/m & y/y, Italian January PPI m/m & y/y, Euro-Zone’s 4Q Gross Fixed Capital q/q, Government Expenditures q/q, Household Consumption q/q and 4Q (Prelim) GDP q/q & y/y, Canadian January Building Permits m£/m and International Merchandise Trade, Canadian 4Q Labor Productivity q/q, US January Trade Balance and Consumer Credit. The week starts with further EUR/USD weakness as Asia sent the pair down to 1.0823 amid the US printed strong jobs figures in February. The nonfarm payrolls (295K) overbeat the market expectations (235K), the unemployment rate fell to 5.5% (from 5.7% last) with slight decrease in participation rate (from 62.9% to 62.8%). The wages, however, grew by unsatisfactory 0.1% on month (vs. 0.2% exp. & 0.5% last). The US 10-year yields advanced to 2.2575% for the first time since Dec 26th on speculations for an earlier Fed normalization. We continue seeing the first FF rate hike on June the earliest. The divergence between the hawkish Fed and the ECB, which starts its monthly 60 billion euro sovereign purchases today, should keep the selling pressures tight on EUR/USD with parity envisaged in mid-run. In shorter-term, despite post-Draghi/NFP oversold conditions, the sentiment in EUR remains broadly negative as Greek Finance Minister Varoufakis meets his EZ counterparts to seek solution to unlock funds to enable the country to service 6.5 billion euro debt due within next three weeks. Option barriers trail below 1.10. EUR/GBP tests bids at 0.72 and below (rebounded from 0.71820 on Friday). Given the mounting political tensions in the UK, offers at 0.70/0.72 should however counter the downside pressures in EUR. In Japan, the economic data disappointed at week’s start. The 4Q final GDP grew 1.5% q/q annualized verse 2.2% expected, the private consumption accelerated 0.5% (vs 0.3% exp.) while business spending unexpectedly contracted 0.1% (vs. +0.2% exp.). In addition, the current account surplus narrowed from 187.2 billion to 61.4 billion yen in January. Dovish BoJ speculations lent support to USD/JPY above 120.61 in Tokyo, former resistance at 120.47/48 should now give support for a push to fresh 7-year highs (above 121.85 hit on Dec 8th). The Chinese exports surged 48.3% on year to February, imports slumped 20.5%. The trade surplus increased from 60.03 to 60.62 billion dollars. Although the Lunar New Year should have boosted the latest trade figures, the foreign demand rose 15% since the beginning of the year, which is good news for China recovery. Good news from China didn’t halt the AUD/USD slide however. The aussie opened the week down to 0.7684 verse USD. A daily close below 0.7685 (MACD pivot) should signal bearish reversal bringing back in focus the mid-term target at 75 cents. In the EM, USD/ZAR crossed above 12 for the first time since 2002 post-NFPs, while South African net foreign reserves declined to 41.92 billion dollar in February. Higher USD, reinforced by its negative impact on gold prices is certainly not good news for the rand and the central bank’s reserves at times they will be the most needed. With the fiscal consolidation lowering the expectations of a rate hike anytime soon, we see strengthening base at 11.40/12.00 (region including 21,50 and 100-dma at 11.7013/11.6079 and 11.4241 respectively). On a similar pattern USD/BRL advances to 3.0718 and USD/TRY hits fresh all-time-high (1.6475) as idiosyncratic political tensions add to global EM debasing. Today’s economic calendar: German January Trade Balance, Exports and Imports m/m, SNB’s sight deposits, Swedish January Household Consumption m/m & y/y and Canadian February Housing Starts. The USD remained broadly offered across the board as Dallas Fed’s Fisher said the emphasis on wages is dangerous, while the inflation should bounce with stabilizing energy prices. Therefore it would be better, according to him, to proceed with an early and gradual normalization, rather than a late and steeper action. The US 10-year yields hover around 2.20%, the DXY index reaches 98.196. The S&P500 added $8 in New York following Friday’s dip to $2,037.27. The recovery is seen limited at February highs ($2,120) before next week’s FOMC meeting (Mar 18th) as hawkish Fed expectations mount. USD/JPY pulls out December top, advances to fresh 7-year high (122.03) in Tokyo on sustained US yields and broad USD appetite. With strengthening positive momentum, we see room for further upside. Next resistance stands at 124.14 (2007 high). Large vanilla bids should give support above 120.50/121.00 for today expiry. EUR/JPY and AUDJPY perform mixed as EUR and AUD weakness counter the JPY debasing. EUR/JPY consolidated between 131.37/87 as AUD/JPY tests 21-dma (93.047) on the downside. A break below should send the MACD in the red territories and signal short term bearish consolidation for the pair. EUR/USD extends weakness to 1.0785. Sentiment remains strongly negative with fundamental shorts building stronger. The market focus is already set to parity. As resistance thickens pre-1.10 psychological level, the deep oversold conditions (RSI at 20%) suggest that a correction would be healthy before further weakness. EUR/CHF volatilities are again very low suggesting that the SNB is perhaps intervening to keep the level at about 1.0680/07 (21-dma). 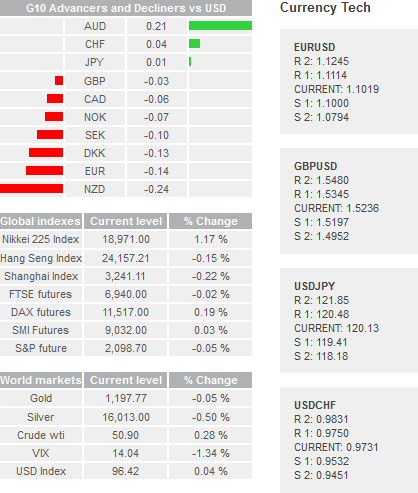 The euroswiss futures advance to 110.77 on expectations that the SNB may go more negative on rates. The Antipodeans were the biggest losers verse USD overnight. According to NAB, the business confidence fell to lowest in February since July 2013 while business conditions remained subdued. AUD/USD legged down to 0.7632 (also impacted by Fonterra issue), the MACD (12, 26) stepped in the red zone. Break below 0.7626 (Feb 3rd low) should increase selling pressures before Thursday’s labor data. Option barriers are placed at 0.7700/50 area. The NZD-complex was squeezed as police said to investigate a threat of contamination on baby formula. While tests showed no evidence of contamination, the recovery to NZD sell-off has been limited. NZD/USD fell to 0.7277. Stronger push to 0.72 is eyed. USD/CAD advances to 1.2648 as WTI stepped back below $50. Friday’s jobs data may reveal further deterioration in jobs market and revive speculations for additional 25 bp cut on April 15th meeting. Break above 1.2698 (MACD pivot & Feb 11th high) should call for fresh 6-year highs (> 1.2800). Else, USD/BRL extended gains to fresh highs (3.1321), overnight interbank deposit futures spiked to 13.90 as traders price in higher borrowing costs in Brazil. The BCB is now expected to proceed with further policy tightening, while protests mount against a sweet combination of probe scandals, Rousseff and Congress inability to agree on budget, economic slowdown and fastening inflation. At this point, Rousseff is comfortably far from getting market’s support behind her. The BRL sell-off continues with next key resistance set at 3.2420 (May 2004 high). Today, traders watch Swiss February Unemployment Rate, French January Industrial and Manufacturing Production m/m & y/y, Spanish January Retail Sales m/m & y/y, Norway January CPI m/m & y/y, Italian January Industrial Production m/m & y/y, US February NFIB Small Business Optimism, US January Wholesale Inventories and Wholesale Trade Sales m/m, US January JOLTS Job Openings. The UK’s industrial and manufacturing production contracted by 0.1% and 0.5% in January, respectively. The unexpected slowdown in manufacturing output is mostly due to 9.5% drop in electronics after large defense industry contract inflated figures in December. The industrial production slowed by 0.1% as computer and electronics production fell 0.5%. The manufacturing output gap is due to one-time event, therefore should have limited impact on market optimism vis-à-vis UK’s economic recovery. GBP/USD rebounded from 1.5037 post-data. The main input in GBP weakness is the election talks. Tories advance verse Labour party should keep the GBP-complex under pressure. As the Cable managed to hold ground above 1.5027/29 (Mar 9/10th support), the bullish harami formation is still valid. The upside attempts should however find buyers on sustained USD-appetite. Offers are presumed at 1.5180/1.5252 (Fibonacci 38.2% / 50% on Jan-Feb pick-up). The next support stands at 1.4952 (Jan 23th low). EUR/USD extended weakness below 1.0600 amid President Draghi said the QE damped long-term sovereign yields, improved the market-based inflation expectations and will help the ECB to meet its price stability mandate. The spread between long maturity core and peripheral yields (with Greek exception) keep narrowing as the ECB started buying sovereign debt since Monday (Mar 9th). Selling pressures on EUR/USD are not ready to dissipate with EU officials meeting in Athens today to find a solution for Greek’s potential insolvability. Greece needs to gather 6.5 billion euros to service its debt within three weeks and will receive 7 billion euros needed to repay its upcoming debt and interests only, and if only, it agrees on bailout terms with the commission, the ECB and the IMF. Traders remain seller on rallies with the immediate target seen at 1.05. In the mid-run, the divergence between the Fed and the ECB policy outlooks paves the way toward the parity. The fundamental EUR/USD short positions are building stronger to counter short-term corrective attempts before 1.10 threshold. Despite the falling appetite in GBP-longs, EUR/GBP clears bids at 0.70/0.72 area. We see bigger challenge at 0.70 support as the UK polls print 33% support for Tories verse 31% for the Labour party (YouGov/Sun poll). And the Conservatives advantage over their rivals should weigh on GBP-complex walking into May 7th general elections. Break of 0.70 support will shift the mid-run target to 0.6550 (2004-2007 support). EUR/TRY took a dive to 2.7763 on the proficient combination of Draghi’s speech, Greek uncertainties and narrower Turkish current account deficit (-2bn verse -2.75bn and -6.81bn last). Following an open below the 200-dma (2.8303), the 21 and 100 dma (2.8142 / 2.7887) were rapidly pulled out in Istanbul. The MACD (12, 26) stepped in the red zone, suggesting short-term bearish reversal. For high risk profile traders, very short-maturity carry positions become interesting. With the one-week realized volatility spike to 16.75% however, the risk of a carry unwind should be considered at all times a short EUR/TRY position is opened. The risk of reversal is preeminent especially in case the agreement with Greece is reached! The 1-month EUR/TRY risk reversals remains above 300 points warning that despite the advantageous rate spread, the high TRY risk may prevent the lira from gaining significant positive traction. EURUSD EUR/USD continues to fall breaking strong support at 1.0765/75. Support lie at 1.0336 (31/03/2003 low). Hourly resistances for a short-term bounce can be found at 1.0717 (intraday high) and 1.1033 (06/03/2015 high). In the longer term, the symmetrical triangle favours further weakness towards parity. As a result, any strength is likely to be temporary in nature. Key resistances stand at 1.1534 (03/02/2015 high) and 1.1679 (21/01/2015 high). Key supports can be found at 1.0765 (03/09/2003 low). GBPUSD GBP/USD is consolidating near the support implied by recent lows at 1.5027. The short-term technical structure is negative as long as prices remain below the hourly resistance at 1.5317 (17/02/2015 low) and 1.5398 (03/03/2015 high). A key support stands at 1.4952. In the longer term, the recent rise is seen as an oversold rebound, whose upside potential should be capped by the key resistances at 1.5620 (31/12/2014 high) and 1.5826 (27/11/2014 high). A strong support stands at 1.4814. USDJPY USD/JPY improved yesterday. A break of the resistance at 121.85 would likely put an end to the recent short-term corrective phase. Major resistance stands at 124.14 . Hourly supports can be found at 121.15 (intraday high) and 120.66 ( rising channel top). A long-term bullish bias is favored as long as the key support at 110.09 (01/10/2014 high) holds. Even if a medium-term consolidation is likely underway, there is no sign to suggest the end of the long-term bullish trend yet. A gradual rise towards the major resistance at 124.14 (22/06/2007 high) is therefore favoured. A key support can be found at 115.57 (16/12/2014 low). USDCHF USD/CHF remains strong as can be seen by the new highs above the resistance at 1.000. Monitor the resistance at 1.0240. Hourly supports can now be found at 0.9831 (24/12/2015 low) and 0.9732 (06/03/2015 low). In the longer-term, the bullish momentum in USD/CHF has resumed after the removal of the EUR/CHF floor. The break of the key resistance at 0.9554 (16/12/2014 low) opens the way for a further rise towards the other key resistance at 1.0240 (14/01/2015 high). A key support can now be found at 0.9374 (20/02/2015 low, see also the 200-day moving average). As widely expected, the RBNZ maintained its official cash rate unchanged at 3.50% and revised lower its growth and inflation forecasts. The NZD is still seen overvalued, yet satisfactory at current levels. The kiwi lost 18.5% over the past 8 months against the US dollar. NZD/USD rebounded from 0.7200 to 0.7383 post-RBNZ. Sentiment should turn positive should 0.7385/0.7400 barriers are cleared before the week close. The negative impacts of baseless news on Fonterra’s baby milk contamination continues weighing on dairy exports. The USD appetite continues dominating the FX markets. The US 10-year yields finds support above 2%, while the DXY index tests 100 for the first time since March 2003. The rising risk is the Fed keeping its “patient” rhetoric at next week’s meeting. Then the relief rally should immediately reverse short-term dynamics in G10, high-beta and EM currencies that have been struggling at deepening oversold conditions since last week’s NFPs. EUR/USD could hardly fall faster after Mario Draghi’s (unsurprising) comments on the QE. The pair hit 1.0495 overnight as buyers are obviously outweighed by fundamental and speculative shorts. With the broad target set to parity, traders should continue find opportunities in rallies to strengthen their short-EUR/USD positioning. As suspected, 0.70 support remains challenging for EUR/GBP-bears. As the GBP-negative sentiment spills over the market on pre-election talks, GBP/USD eases to 1.4893, lowest since Jul’13. The bias remains on the downside with vanilla puts trailing below 1.4950/80 area. The key support stands at 1.4814 (Jul 9th 2013 low). USD/CAD tested fresh 6-year highs (1.2799) as the WTI crude legged down to $47.33 in New York yesterday. The MACD (12, 26) stepped in bullish zone suggesting fresh interest in USD/CAD longs. Vanilla calls trail above 1.2650/1.27 and should give support before Friday’s labor data. The expectations are soft, therefore keeping the divergent BoC/Fed bets in charge for further loonie weakness verse USD. In Brazil, the BCB minutes are due today and investors focus on bank’s comments about the accelerating consumer prices. The minutes will likely fall short of BCB hawks, while the central bank will doubtlessly leave the door open for further Selic rate hike given that it has little option other than conducting an aggressive, tight monetary policy to make sure to not lose control over the inflation diverging significantly from the BCB’s target. Indeed, the concerns on Rousseff’s ability to restore a fiscal discipline, the substantial depreciation in BRL combined to hawkish Fed expectations require tighter monetary policy, as the economic slowdown remains a major issue. There is the dilemma. The Congress postponed vote on the budget bill to March 17th. 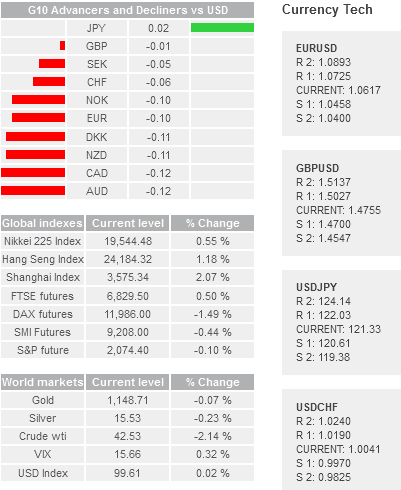 Today traders focus on German, French and Spanish February Final CPI m/m & y/y, Swedish February Unemployment Rate, UK January Trade Balance, Euro-Zone January Industrial Production m/m & y/y, Canadian 4Q Capacity Utilization Rate and February Teranet/National Bank HPI m/m & y/y, Canadian January New Housing Price Index y/y, US February Retail Sales m/m, US March 7th Initial Jobless & February 28th Continuing Claims, Us February Import Price Index m/m & y/y, US January Business Inventories, US 4Q Household Change in Net Worth and US Monthly Budget Statement. The USD remains broadly in demand as traders continue adjusting positions to hawkish Fed expectations on next week’s FOMC meeting (Mar 17/18th). USD/JPY traded better bid in Tokyo, alongside with Nikkei stocks 1.39% higher on the session. BoJ’s Kuroda said the inflation should rise with wages and improvement in inflation expectations. With higher US yields, USD/JPY should continue challenging 122 offers on the upside. Large vanilla bids will give support above 120.00/50 before the week close. 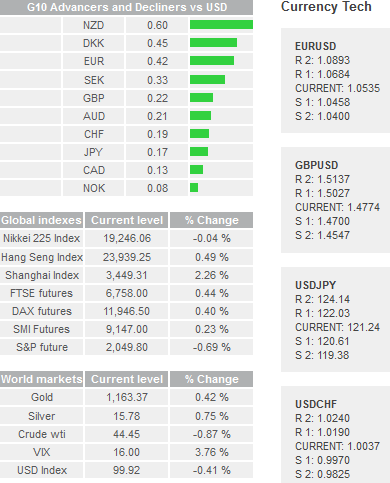 EUR/JPY recovers slightly as sell-off in EUR/USD and EUR/GBP curbs. 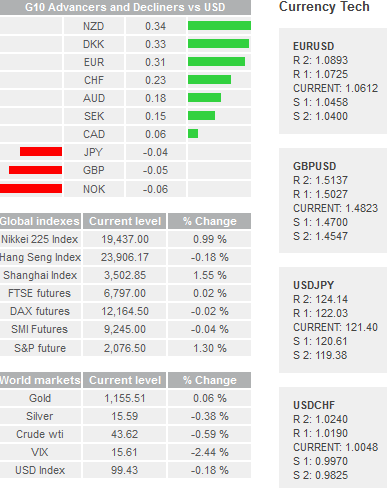 The EUR-negative sentiment remains strong however. Resistance builds stronger pre-130. 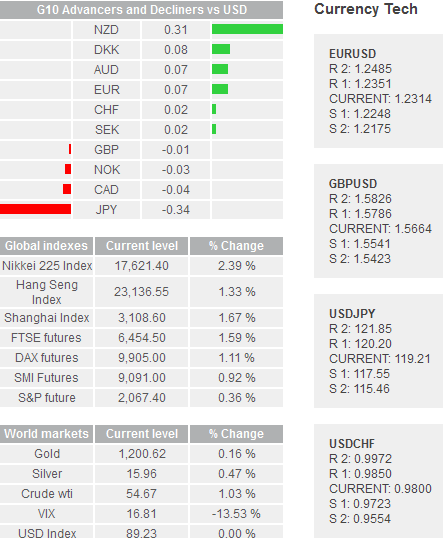 Market is solidly negative on EUR/USD, bullish attempts find sellers. We hear talks on further cut on deposit rates to allow the ECB to widen its pallet for bond purchases (as ECB is not allowed to buy bonds yielding more negative than the deposit rate). The EUR/USD will step into the FOMC week without having resolved the Greek issue. Tensions between Greece and Germany mount adding to downside pressures. EUR/GBP pares losses (after Mar 11th 0.70143 low) as GBP/USD extends weakness to 1.4846. With stronger bearish momentum, the break below 1.4814 (Jul’13 low) should happen in smooth fashion. Decent option barriers at 1.4980/1.50 will weigh on the Cable at today’s expiry. USD/CAD tests the January highs (1.2799) as weakness in crude oil continues. Trend and momentum indicators are marginally positive, suggesting a potential interest for new 6-year highs if market expectations for poor labor data materializes. Combined to hawkish Fed positioning, decent vanilla bids are waiting above 1.27 before March 18th FOMC decision. In a report released yesterday, Fitch stated that 3.75 levels in USD/BRL would bring exporters to their competitive position before 2004 as the inflation hit companies’ cost structure over the past decade. We remain cautious on these comments as lower real would reinforce the steepening in inflation trend in Brazil, which in turn, should further weigh on the currency. Is improvement in competitiveness really part of the picture given the tight relation between inflation and the exchange rate? USD/BRL extends gains to 3.1714, sturdier bullish momentum and strong USD appetite will certainly prevent traders from holding BRL-long position through the week-end. The key resistance stands at 3.2420 (May’04 high). The Russian Central Bank gives policy verdict today. The consensus is a rate cut from 15% to 14%, or more. The rate cut should trigger limited sell-off in RUB given the still-very-high rates and restrained RUB trading outside Russia. The economic calendar today: Italian February Final CPI y/y, Italian January Government Debt, UK January Construction Output m/m & y/y, Canadian February Unemployment and Participation rate, Canadian February Existing Home Sales m/m, US February PPI m/m & y/y, University of Michigan’s March preliminary Sentiment Index and 1-yr/5-5yr Inflation Expectations. It has been all but a calm Sunday in Brazil. Following the street protests by over a million citizens, the government promised to present a package of anti-corruption within days. We are long gamma in BRL as higher volatilities will not be easy to dissipate before a satisfactory solution is offered to citizens in Brazil. The 1-month USD/BRL implied volatility advances to 21.9%, the 1-month risk reversals have spiked to 336 points. The WTI crude started the week downbeat, sold-off from $45 to $43.57 as Chinese Premier Li said it will not be easy to achieve 7% growth in 2015. 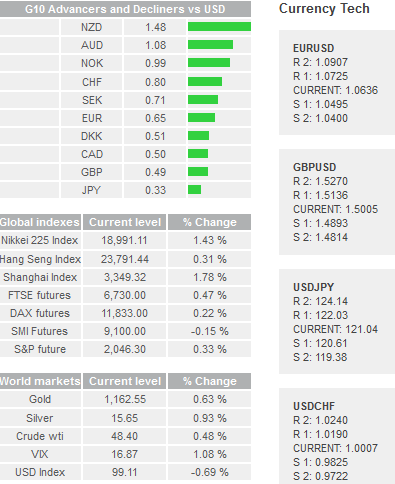 Buying interest is presumed above $40 as nuclear talks with Iran start today in Lausanne, Switzerland. Should the Iran sanctions start waning, it will only happen gradually. Failure in oil recovery is certainly not good news for the loonie, that hit fresh 6-year high amid Friday’s job report. The Canadian labor market has been through a soft month in February, with unemployment rate up to 6.8% (from 6.7% exp. 6.6% last) and participation rate little changed (from 65.7% to 65.8%). Canada lost 1’000 jobs (vs. -5K exp. & 35.4K last), with however 34’000 full-time jobs added verse 34’900 part-time jobs off. USD/CAD advanced to fresh 6-year high of 1.2824. Trend and momentum indicators remain comfortably positive on the combination of lower oil and hawkish Fed expectations before March 17/18th FOMC meeting. Option markets are supportive of an extension toward 1.30. 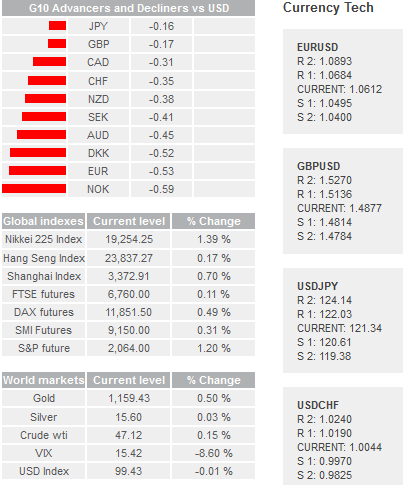 EUR/USD hit fresh low of 1.0458 in Asian open. The sentiment in EUR remains comfortably negative as Greek uncertainties persist. Large put expiries at 1.0500/75 should anchor the market down. There is opportunity to sell the rallies before the FOMC meeting, corrective upside moves under constant pressure. EUR/GBP trades water between 0.70950/0.71357. With fading GBP-appetite, a close above 0.7190 (MACD pivot) should push the pair in short-term bullish consolidation zone to meet offers at 0.72486/0.72600 (Fib 23.6% on Dec’14-Mar’15 sell-off & 21-dma). 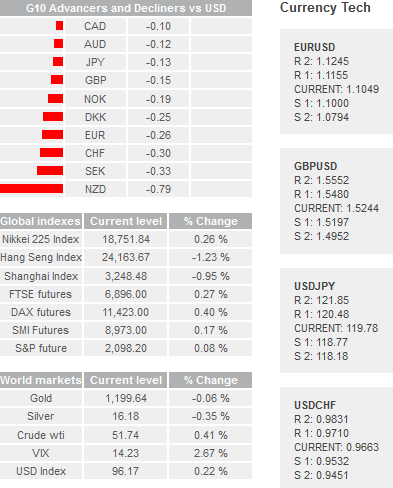 JPY crosses were mixed in Tokyo, Nikkei stocks did little (-0.04%). USD/JPY remained ranged between 121.16/48 with decent support from the option market between 120.00/121.50 area. EUR/JPY consolidates below 128.53 (Fib 61.8% on 2012/2014 rally), the sentiment in AUD/JPY turns flat (MACD at the zeroline). Russian Central Bank eased the key rate from 15% to 14% as expected on Friday. The rate cut had little negative impact on RUBgiven the still-very-high rates and restrained RUB trading outside Russia. The economic calendar today: Swiss February Producer and Import Prices m/m & y/y, Swiss January Retail Sales y/y, Canadian January International Securities Transactions, US March Empire Manufacturing, US February Industrial Production and Capacity Utilization, US February Manufacturing (SIC) Production, US March NAHB Housing Market index, US January Net Long-term TIC Flows and Total Net TIC Flows. The BoJ maintained the pace of its annual monetary base increase unchanged at 80 trillion yen, while the core inflation (at 0-0.5% range) is seen as depressed. Japan FinMin Aso mentioned China as a downside risk to Japanese recovery, while adding that one-two year period is not enough to modify the mindset in an economy after 20 years of struggle against deflation. According to Reuters survey, 55% of Japan firms would continue pushing wages higher, however, ’14-’15 combined salary increases would not be sufficient to cover April’14 sales tax hike. Hence the obstruction is well beyond the Japanese household mindset! JPY crosses traded mixed, the Nikkei stocks advanced by 0.99%. USD/JPY remained ranged at 121.25/52 in Tokyo. Trend and momentum indicators remain marginally bullish, primarily subject to FOMC positioning. Vanilla calls trail above 120.80/121.00 for today’s expiry, yet fresh boost is needed to clear 121.85/122.04 supply zone. The Fed may be that fresh boost, if as expected, it removes its call for “patience”. The US 10-year yields stabilize at 2.05% / 2.10% as the FOMC starts its two-day policy meeting today. EUR/USD consolidates losses, the Greek/EU agreement remains a pending issue. Eurozone’s February final CPI figures are due today, the consensus is +0.6% improvement on month and stable headline inflation at -0.3% and core inflation at 0.6% on year. The sentiment remains comfortably negative with limited room for recovery before Mar 18th FOMC verdict. Resistance is seen at 1.0712 /25 (Fib 23.6% on Feb-Mar drop / optionality). We see open-end downside with explicit global mid-term target set at the parity. The divergence between the Fed and the ECB will keep the bias negative, yet an immediate EUR-unwind is contingent on Fed decision tomorrow. The minutes of the latest RBA meeting revealed that a rate cut has been considered (we never doubted it), yet the committee decided to wait for more data. Nobody knows how long the RBA will remain on hold or will there be any need for additional rate cut; it also depends on relative rate divergence across the globe. A concrete step from the Fed toward policy tightening will push AUD/USD toward Stevens’ 75 cent target and lower, and will certainly postpone a potential RBA action on rates. Central Bank of Turkey gives verdict today and is expected to maintain the status quo amid President Erdogan and government softened their aggressive call for lower rates last week. While traders remain skeptical due to non-null event risk (maybe a tiny 25 basis point cut as twinkle to politicians? ), a non-action should revive short-term TRY bulls. On USD/TRY, the support is presumed at 1.5840 (Mar 12/13 double bottom) as hawkish FOMC bias should keep the USD appetite tight. The visibility thereafter is limited and it all depends whether the Fed will stop calling for “patience” (base case scenario) or not. GBP/USD recovers reticently as latest polls suggest the advance of the Labour party over Tories (Populus poll: Labour 32%, Conservatives 29%, ComRes poll: Labour 35%, Tories 33%). We attach little importance on poll results given their highly volatile results. Yet warn traders on potential rise in GBP volatilities walking into May 7th general elections. Uncertainties should anchor the GBP down verse USD. 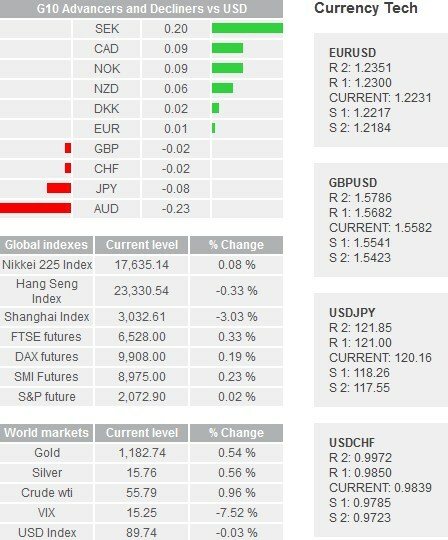 Election jitters thicken 1.50 barriers on the option markets. Today, traders focus on EU27 New Car Registrations in February, Spanish 4Q Labour Costs y/y, Norwegian February Trade Balance, Euro-zone 4Q Employment q/q & y/y, German March ZEW Survey for Current Situation and Expectations in Germany, Expectations in the Euro-zone, Euro-zone February CPI m/m & y/y, Canadian January Manufacturing Sales m/m, US February Housing Starts and Building Permits m/m. Today’s key event is the FOMC decision due at 18:00 GMT, limited price action should be seen across the FX markets globally. 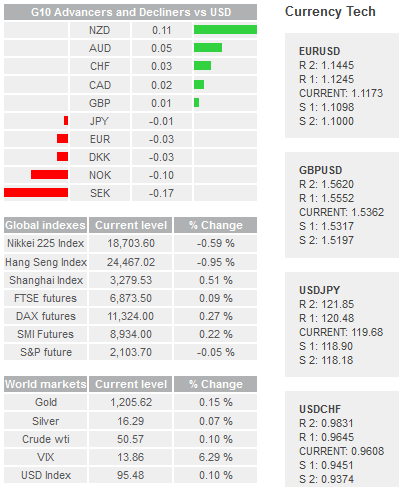 Traders make the final adjustments to their positioning, with USD broadly higher in Asia. This is because the Fed is expected to drop its call for “patience” at this month meeting, which will be perceived as a concrete step toward a rate normalization. While the hawkish Fed expectations are already priced in across the money and currency markets, there is greater chance of seeing a more significant reaction on the stock indices. After last week’s depressed market, the S&P futures recovered timidly to $2,081 yesterday, Dow Jones futures gapped lower (after the unusual jump at yesterday’s trade), while Nasdaq has outperformed its US peers by advancing steadily to$ 4,384, still below the 21-dma. WTI crude legged down to fresh low of $42.44 following the slide to fresh lows that has already started in New York yesterday. The fresh weakness in crude pushes the oil industry into deeper panic. Royal Dutch announced to disassemble ¼ of its platforms in the North Sea, while 1/3 to ¼ of BP’s UK fields are uneconomic said the CEO of the group. Fighting for its market share, the Saudi Arabia already prints deficit, while the US continues producing 9.4 million barrels per day, through a constant uptrend. The panic in oil prices keep oil producer currencies downbeat. USD/NOK extends gains to 8.3323, combined to Norway’s shrinking trade balance to 21 billion NOK from 27.1 billion a month ago. Norges Bank is expected to lower the deposit rates from 1.25% to 1.00% on March 19th meeting. The wider divergence between the Fed and the Norges Bank suggests steady advance toward 2000-2001 range of 8.50/9.50 range. 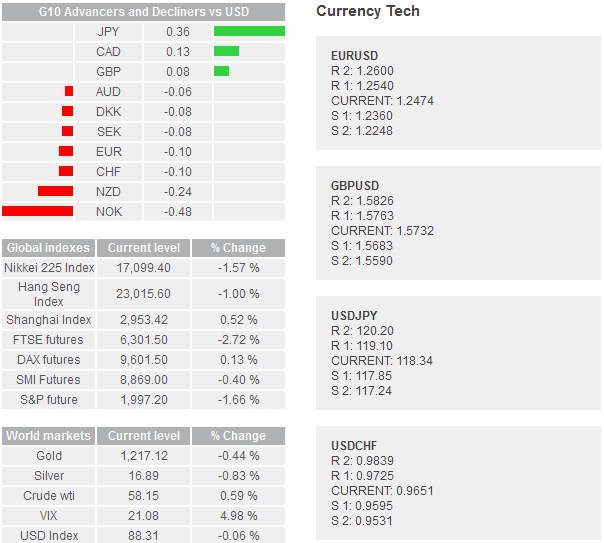 USD/CAD tests 1.2800+ offers, while USD/RUB trades ranged given the limited RUB transactions overseas. There is nothing new on the EUR-complex. The EUR sentiment remains comfortably negative, both on hawkish Fed expectations and Greece seeking liquidity provision at EU summit. In Frankfurt, street protests against the ECB are in European headlines! Uncertainties should keep the EUR market anchored on the downside. EUR/USD sales are touted below 1.05, EUR/GBP faces solid offers at 0.7200/0.7250 (including option barriers, Fibonacci 23.6% on Dec’14 – Feb’15 sell-off and the 21-dma). EUR/JPY hovers around 128.52 (Fib 61.8% on 2012-2014 rally). Large option barriers are placed at 130+. In Japan, the trade deficit narrowed well above expectations in February, from -1-179.1 billion (revised) to -424.6 billion yen. Exports to US rose 14.3%, to China slumped by a significant 17.3% confirming FinMin Aso’s warnings yesterday (on China being a downside risk to Japan recovery). USD/JPY remained ranged in Tokyo (121.26/41) alongside with the 10-year US yields narrowing just above 2.0%. The major focus is the FOMC decision today. Hawkish Fed carries potential for an easy cross above 122.03 (Mar 10th high). Option bets are supportive above 121.50 for today expiry. A post-FOMC close below 120.97 (Ichimoku conversion line) should however anchor the market below March highs. The New Zealand’s current account deficit narrowed less than expected, the CA-to-GDP ratio fell to -3.3% from -2.6% in the 4Q. The weakness in dairy prices continues, with lower volumes and the GDT index down by another 8.8% at the latest Fonterra auction. NZD/USD remains downbeat, the negative bias keeps the 0.72 support in focus, and stops are eyed below. The economic calendar of the day: Italian January Trade Balance, UK January Unemployment rate and Weekly Earnings, UK February Jobless Claims Change and Claimant Count Rate, Euro-zone January Trade Balance and Construction Output m/m & y/y, Credit Suisse’s ZEW Survey on Expectations in Switzerland, US March 13th MBA Mortgage Applications, Canadian January Wholesale Trade sales m/m and later on New Zealand’s 4Q GDP q/q & y/y.